I have had the good fortune to travel the world and experience the habitats and climates of many of the species that we keep in captivity. As a result my husbandry experience is based upon personal field experience (and emulating this) as opposed to copying the experiences of others from literature. I am not a great believer in “artificial husbandry”; by this I mean that I am not an advocate of artificial lighting, heating, substrates, etc. The reason being that we simply do not know enough about the physiological and psychological needs of many captive herp species that we may assume we know what’s best for them by some artificially created product. For example, all one has to do is get the best UV bulb or tube available and place a lizard under it, then open a window and let natural unfiltered sunlight in and you are guaranteed to see the lizard running to bask in the natural sunlight every time! So why go trying to beat nature when so many natural conditions required by reptiles are there for free already and far superior to anything made by human hand? 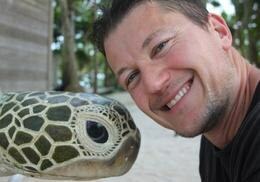 This does however limit your range of species to those that can adapt to your native climate! I have applied this mentality to the various species I have kept over the years- only keeping species which I can keep largely if not all the time outside in the UK climate, that way ensuring that they get all the benefits of the “wild” as opposed to an artificially created environment. My work has previously been with many of the East African montane species such as Trioceros jacksonii spp, hoehnelii, rudis ssp, fuelleborni, etc., and these have succeeded to a degree outside or in the greenhouse and produced to multiple generations. But, despite the animals ability to tolerate cold night time drops (I have had T. hoehnelii down to -2ºC (~28ºF) with no issues) there is a tolerance to only short spells of cold. This is like cold winter nights in the moorlands of high altitude Kenya where the daytime temperature generally does rise to the mid to low teens and there is sunshine almost everyday. Thus, the animals can bask and raise their metabolism accordingly, in readiness for the next nights freeze! This is not something we experience during the UK winter; we have night time temperatures down to -9c sometimes and for days the temperature will rarely go above freezing, and this is not something the Kenyan (and Tanzanian) montane chameleons are adapted to, leading to fatalities unless they receive a little help and basking lights during the day, which is not a route I wanted to go down. The ideal species I was looking for could actually tolerate a long cold winter spell and, like so many other temperate species, may even enter a dormant period to evade the winter and thus potentially endure what we can offer here in the UK 12 months of the year. 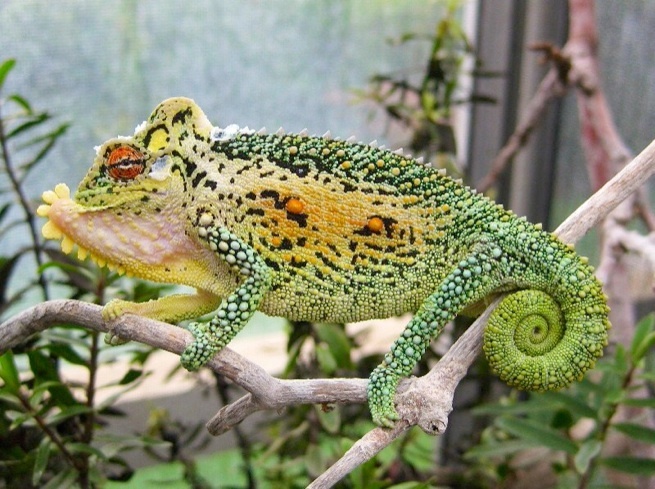 Chamaeleo chameleon offered potential with regard to winter dormancy, but of course is unavailable legally so was a no go. I was aware that Bradypodion thamnobates was being bred in Europe by a few breeders and that my late friend Bert Langerwerf bred many of them outside 12 months of the year in both Europe and Alabama. 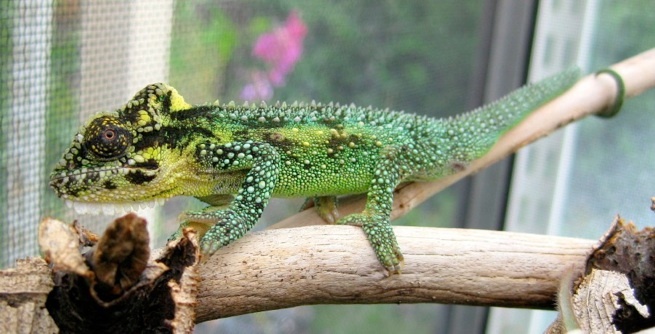 By coincidence I also had friends in the Natal Midlands region where the dwarf chameleons occur and they could give me a break down of their summers and winters, and just how similar they were to the UK, bingo! They also gave me valuable insights into the wild behavior of these animals throughout the year as they frequently saw them in their gardens, often going dormant in the flowerbeds, under the log pile or in the garage! I obtained various young adults from European breeders and raised them in a purpose built greenhouse which was covered in 2mm UV transmitting acrylic (which when tested let around 90% UV through). 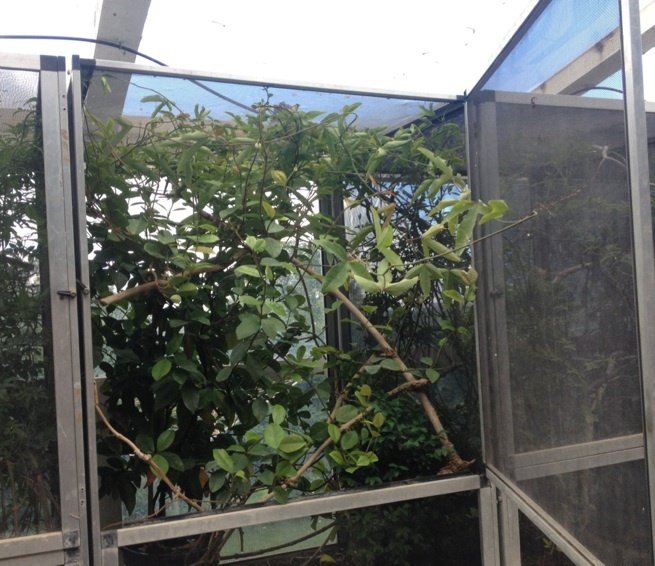 The chameleons themselves are raised individually in mesh cages with natural leaf litter on the floors and an array of branches and live, primarily evergreen plants (Passiflora, Jasminoides, Trachelospermum, Lonicera, Hebe, Pieris, Callistemon, various south African restios). 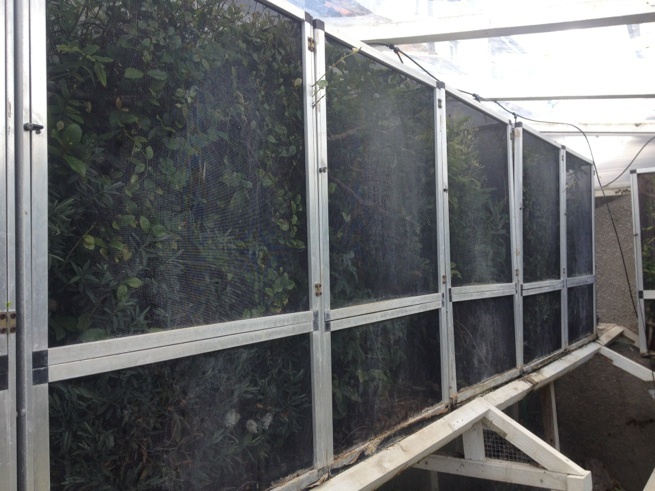 The cages are automatically misted up to six times a day in the summer and only once or twice in the winter. Fig. 1. Rows of cages in my greenhouse, all directly under UV transmitting acrylic, the mist piping can also be seen along the top of each cage. Mesh vent panels are present at either end to allow adequate airflow. Fig. 2-3. 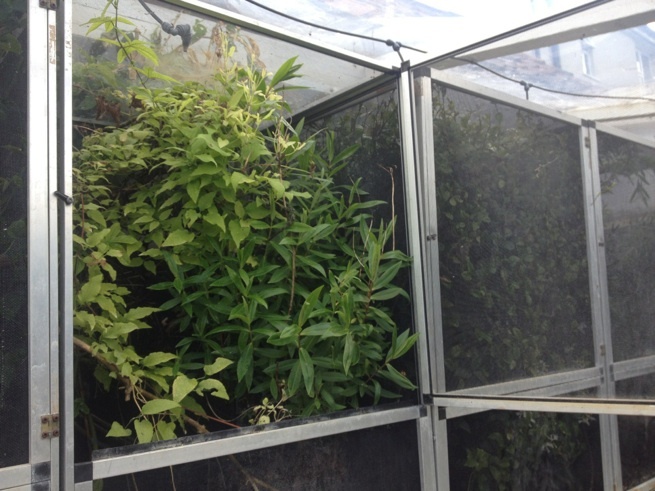 Cage details: Each cage is unique with regard to its plant species and layout. 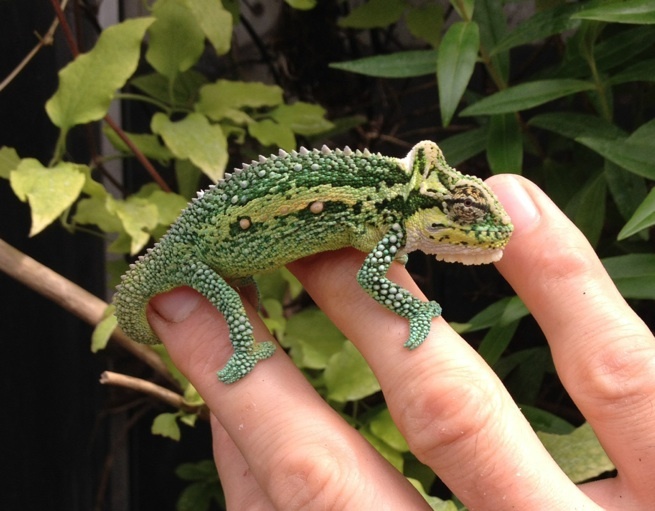 I try to experiment with different plant sizes and textures to see what the chameleons like best. All cages share a range of light and darker areas, wet and dry; choice of microhabitat is the key on a day to day basis. Fig. 4. A typical adult male Bd. thamnobates, I have seen such red-flanked animals from Nottingham Road, Mooi River and Rosetta (they are often incorrectly named the Nottingham Road morph). Fig 5. A yellow-flanked male, often seen living in the same areas as the above, colour and pattern variation is very common within the thamnobates range. 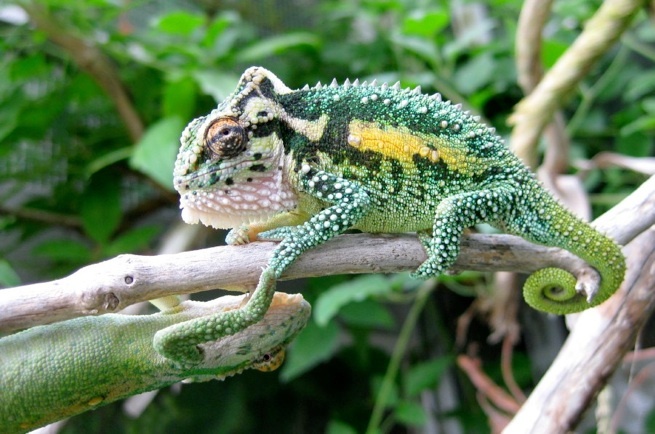 No two chameleons are the same, even in the same area and each colour form will be equally likely to produce the other and everything in between in subsequent clutches. Unfortunately, over the course of the first few years I found that most of the animals would not make it through their first or second winter. This didn't make sense; why can an animal endure similar if not harsher conditions in the wild and survive and yet fail here? Fig. 6. A beautiful female in full blown aggressive display (at me!). 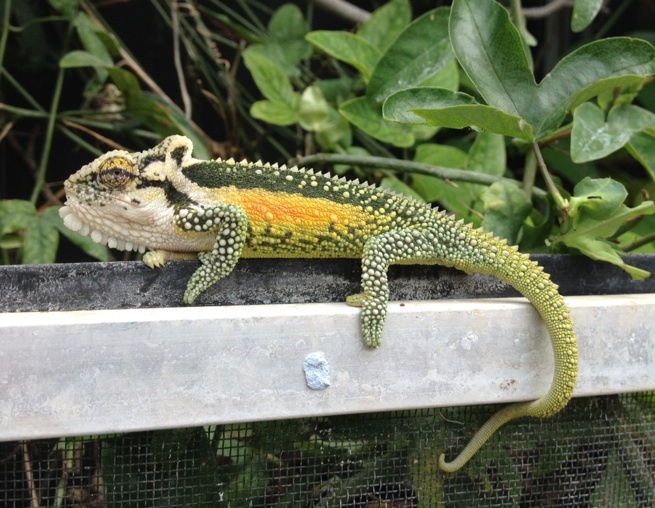 The answer came from my experience of keeping many other temperate species, largely Lacertas and Podarcis lizard species which on the whole do terribly indoors but very well outside long term. 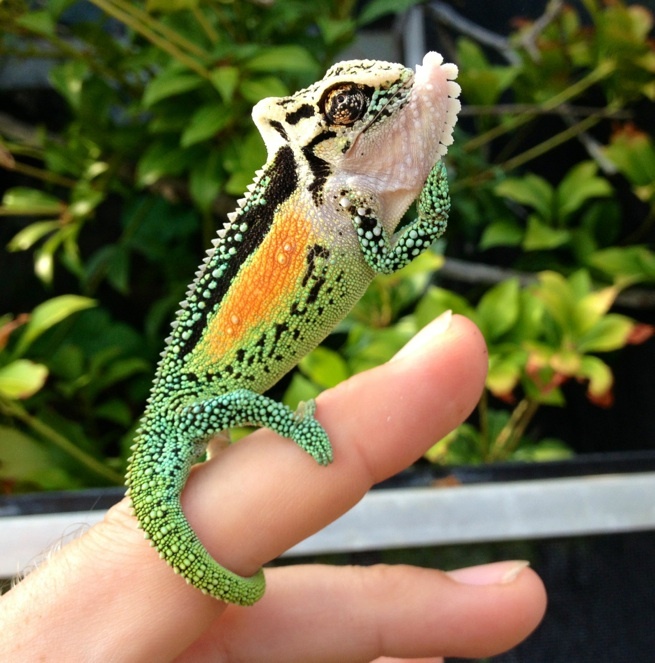 In order for such lizards to endure warm summers and cool wet winters they have to endure winter from their very first year as they would do in the wild. This is an essential piece in their long term story, for if they miss their first winters cold they have missed a vital piece of their body clock and metabolic process that will allow them to successfully switch into active breeding mode in the future. It also sets them up for future winters to come- the next time they experience the onset of winter they know exactly what to do- dig! It is a great shame that many folk like to keep their baby animals warm and fed for the first winter to “grow them on a bit” or “surely they are far too small to endure a winter!” I know it is always a risk or concern, but it is something the animals have evolved to do from an early age, and if they are to continue to thrive in captivity as they do in the wild then we must emulate this accordingly or we are simply kidding ourselves. Fig. 7. An “emerald” Bd. thamnobates, origin unknown but assumed to be the same as the above; the adult offspring derived from this male and the following female can be seen in figs 9-13. Fig. 8. 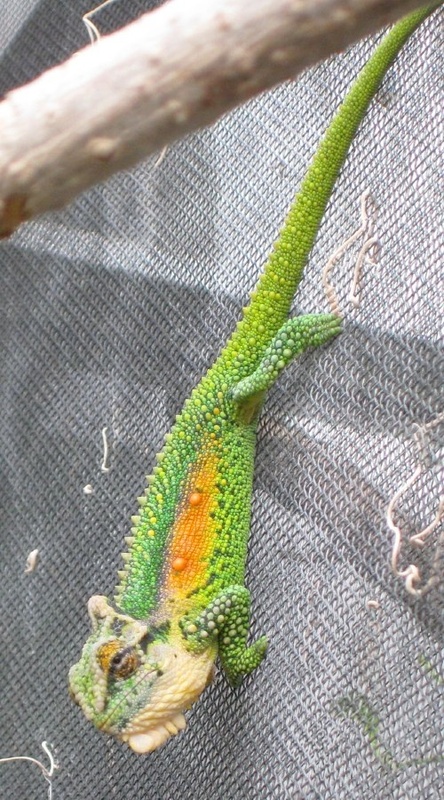 An “emerald” female, at present such animals are believed to be just variations on the typical thamnobates colour and pattern, as suggested by their offspring shown in figs 9-13. This led to the penny dropping for me and my founder stock- the majority of European bred Bd. thamnobates are raised indoors under artificial conditions and few receive any form of winter dormancy period, let alone a true experience of winter. So my founder animals were simply too naïve to know what to do as day length and temperature decreased, thus leaving them vulnerable to the elements and more importantly wasting fat reserves by attempting to be active during the long winter period when they should be sleeping, leading to weight loss and disease. Figs. 9-11. Adult male siblings from the above pairing of “emerald” parents. It was expected that such a cross would result in emerald offspring, but the result was surprising- every animal was different, illustrating the many incorrectly described locales or morphs within a single clutch! With this in mind I made sure that all of my own produced offspring went through a cold period right from their first winter, assuming they were born in the summer and thus had sufficient weight and fat reserves to endure long period of time without feeding in the cold. If they weren’t large enough or were born late in the summer when insects were getting scarce I would hold them back for a few months in my garage to make sure they did feed ok and grow before putting them through a cold period in my garage or if the winter seemed mild they were placed outside in the greenhouse. Figs. 12-13. Adult female siblings from the emerald cross. The result was that my own bred and raised animals came through the winter either in the greenhouse or in the cold garage with 100% success! It also means that following dormancy they enter their normal breeding cycle upon the onset of spring, resulting in some spectacular colour displays amongst the animals. Young are generally born in the mid to late summer and all are left in situ if possible, gaining sufficient weight before the cold arrives in November. 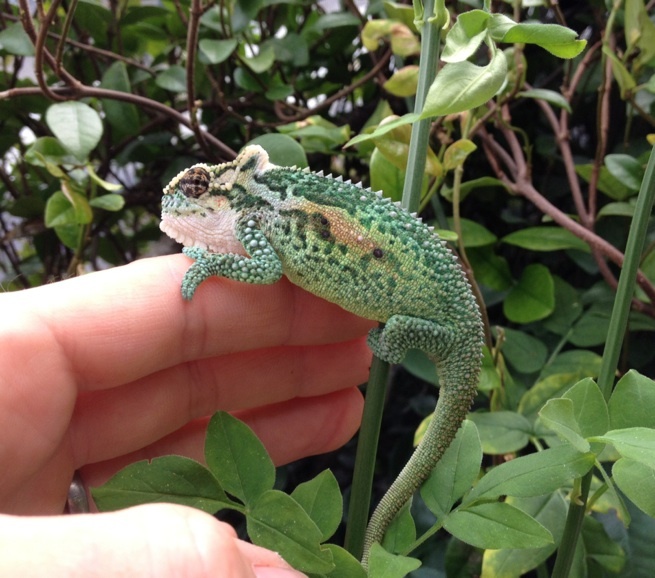 If things look good and mild (with night time temps not dropping much below freezing) I leave the chameleons in the greenhouse where they almost completely disappear in the centres of bushes or I heap leaf litter on the floor of the cages to provide areas to hunker down into. 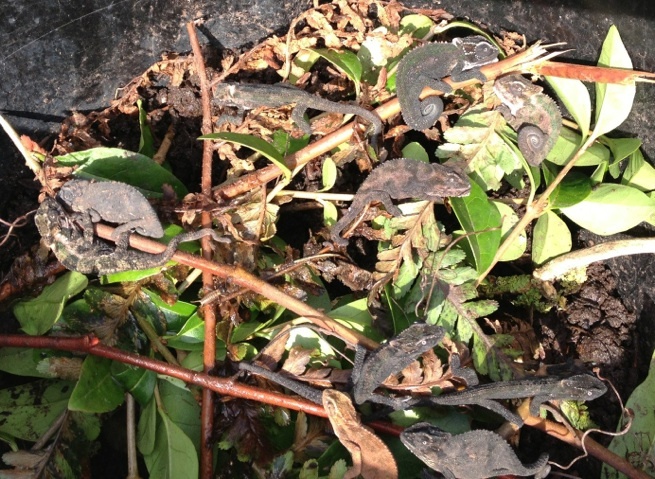 If it looks like we are going to have a harsh winter with sustained day and night freezes then I remove as many chameleons as I can find and place them in leaf litter lined buckets with many branches and twigs so that they can either cling on or burrow down to the bottom. The buckets are then placed in the garage with plywood over the top, giving them almost 24 hour darkness and temps of around 2-7 degrees C. This allows them to sleep still and cool. On sunny winter days when the temperature warms the garage sufficiently so that they start to wake and walk around I place the buckets outside in the sun to allow them to bask and warm up, they don’t feed though. Then at night the buckets go back into the garage until the next warm spell. Fig. 14. 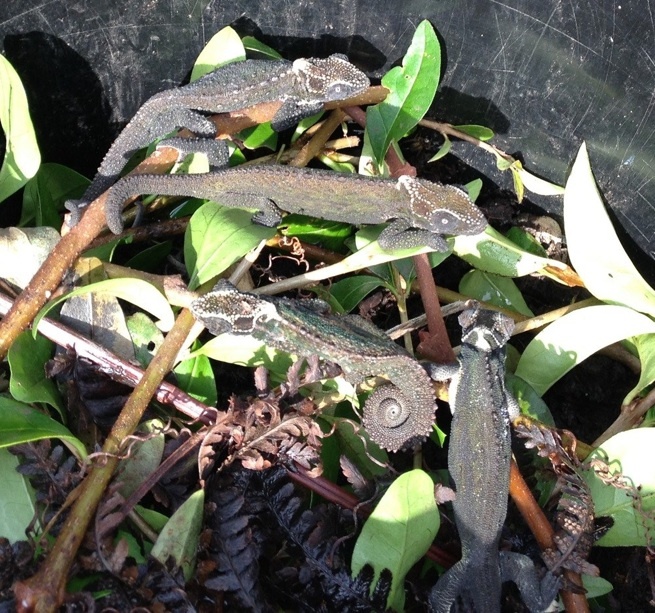 Adult thamnobates in a wintering bucket. They are kept in these buckets for up to 4 months during the winter in 24 hour darkness at a temp of around 2-7 degrees C. On days when it gets warmer than this (and sunny) the bucket is placed out in the sun for a few hours so they can bask and raise their metabolism, allowing them to purge the system and reset themselves in preparation for the next stage of winter. Fig. 15. Juvenile thamnobates in their first winter bucket. 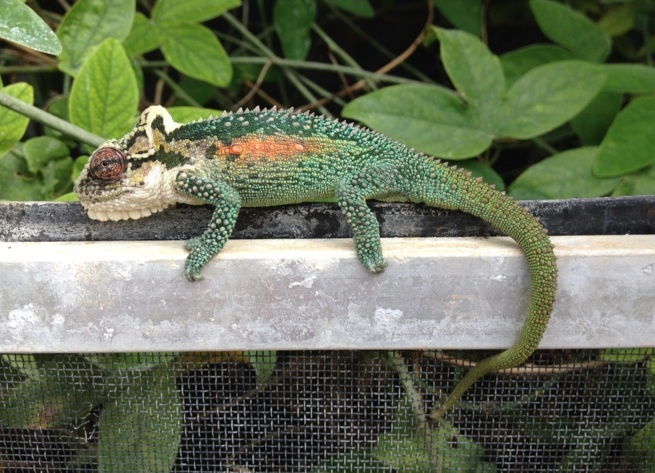 In this particular year we experienced night temperature drops to around -10 degrees C which would have put the chameleons at risk, so they were placed in the buckets in the garage for a more safe approach to winter dormancy. In the wild and if properly protected they may well endure and survive such conditions but in captivity with limited gene pool it is not worth risking losses when they can be easily put through dormancy at slightly higher temps in the protected garage. Of my recent animals I am now on at least my own F2 lineages of Bd. thamnobates born and raised outside. In the course of time I have been told and shown various “locales” of Bd. thamnobates. 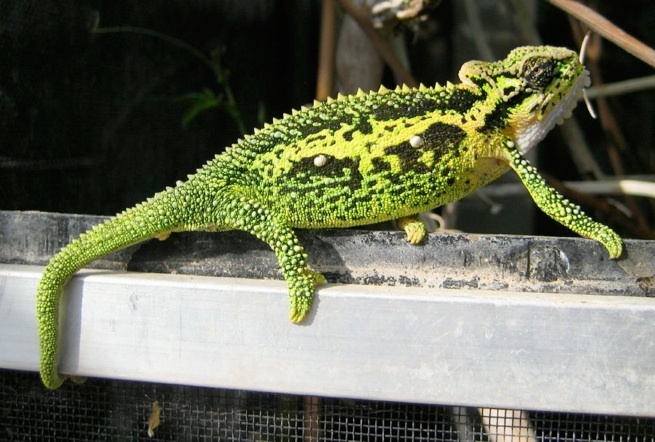 The accuracy of such animals remains to be confirmed as I have personally witnessed and also been shown photographs by friends in the Natal Midlands of an array of specimens expressing a whole range of colours and patterns that do not correspond to any one location. For example animals with blue backgrounds and yellow lateral markings can be found in the same areas where animals with red flanks and dark background colouration occur! When I have crossed a very blue animal (with yellow eye turrets) with an equally blue green female (with little or no lateral markings) I expected to get similar offspring. The result was surprising once the offspring reached maturity the following year- every animal was different, collectively expressing every colour phase and morph described in the herpetocultural literature, but all from one clutch! I have had subsequent other clutches from other lineages which have also produced similar mixed bags, so assume my wild based observations are correct and that Br thamnobates is highly variable within its range and at this present time not locale specific in terms of colour. Further genetic work is required (and being undertaken) in order to ascertain the true genetic relationships and variation within Bd. thamnobates and also its relationship with other closely related Bradypodion species within Kwazulu-Natal.